I ordered these for my grandkids and they are really cute! They seem to be good quality and they always like to get an ornament with their name on it. I put the year on the back, so when they have their own tree they can look back over the years. Nice memories. I will give the grandkids their ornaments at Family Thanksgiving because they put up their tree that weekend. Daughter in law wanted ornament personalized. It turned out perfect. 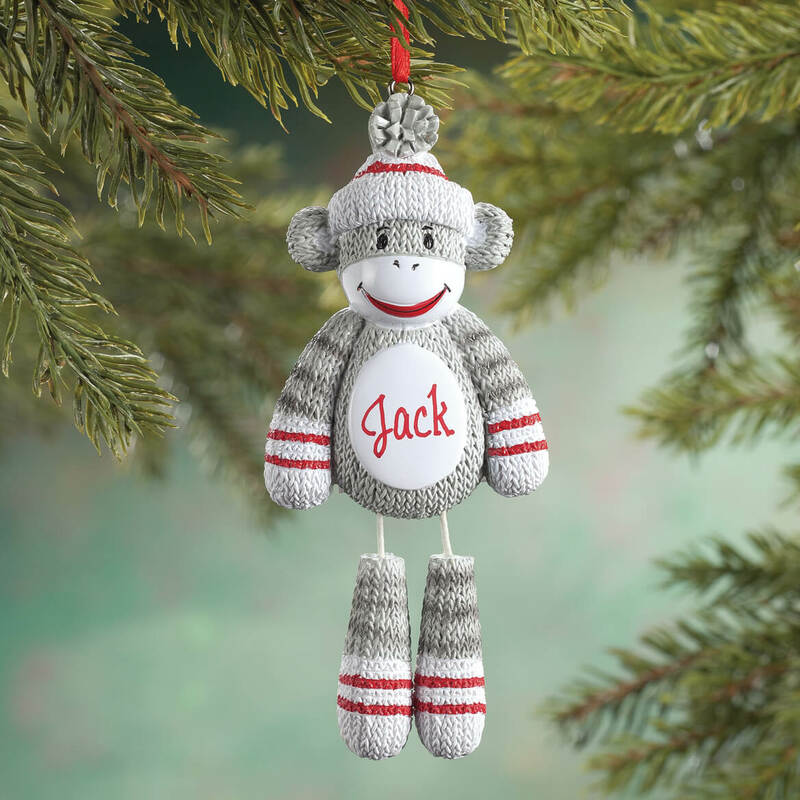 The personalized sock monkey ornaments are for family Christmas presents. The personalization was done very professionally and accurately. It is cute, funny and just right for the person. I ordered this for myself, it looks so cute! They are very creative and different from others I have seen. An item a relative always wanted but never would have purchased for themselves. It was less expensive on this site vs. other sites - personalized and all. Grandson who is a monkey. My son likes sock monkeys. Grandson who's 4 and loves monkeys! I ordered two PLAIN Sock Monkey's Ornaments. I want one PLAIN, Sock Monkey Ornament, Personalized with the name BOOTS on it. 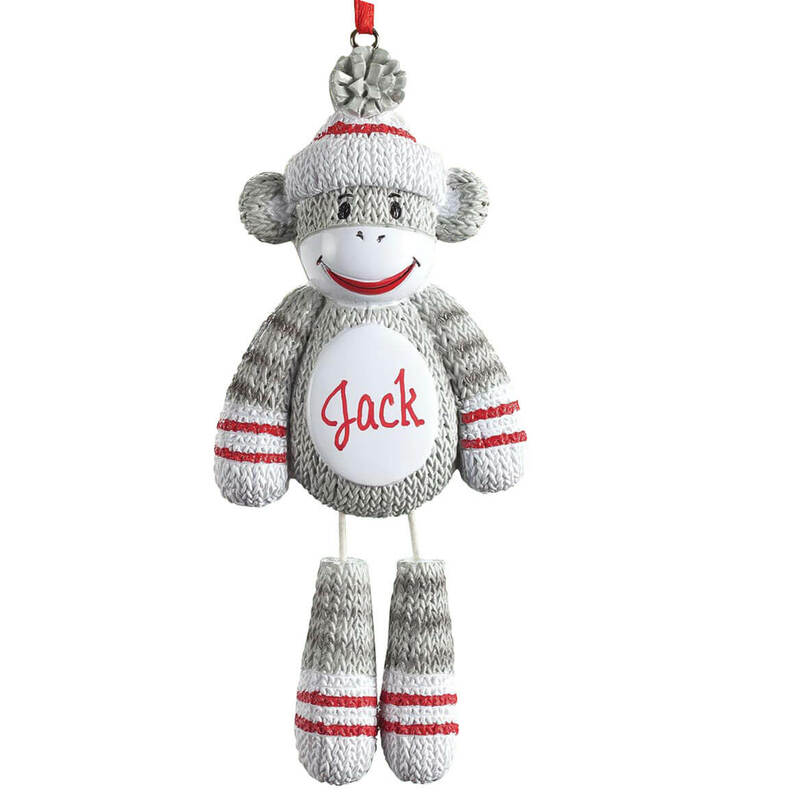 Then the other PLAIN Sock Monkey Ornament, I want it Personalized with the name MISSY on it. ONE: "BOOTS" then TWO: "MISSY"
so cute. already ordered for 7 other people, but forgot someone, oops, and wanted the same one. for grandson and I think it's cute. Found you on internet search for "Monkey Ornaments". My name is not Tony!!! Because my 50+ daughter loves the sock monkey. I have a large collection of sock monkey items. I saw this ornament and knew I had to have it! I saw no gymnastics ornament, but my nephew is known as a monkey at his gymnastics class. My son collects sock monkeys. This was so cute!